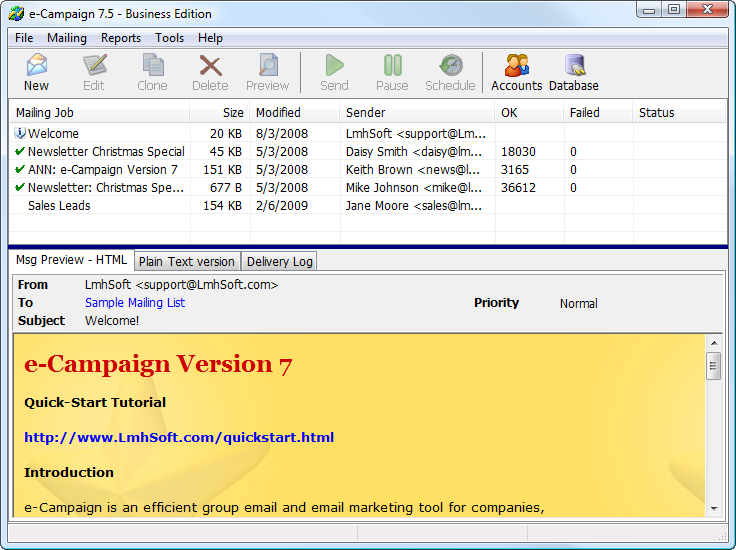 e-Campaign bulk email software enables you to easily design rich HTML emails and newsletters, and deliver personalized HTML emails to your target audience using mailing lists. e-Campaign sends a personalized/separate copy of your email to each address in your mailing list (one at a time); and each recipient will see only his/her email address in the To: field. You can personalize every respect of your message: email subject, message body. ...... You can personalize every respect of your message: email subject, message body, file attachments, and even embed different images for different recipients in the same mailing list. Among the key features are mail merge, personalized file attachments and images, support for popular databases (Access/Excel, SQL Server, MySQL, etc), WYSIWYG HTML composing, built-in SMTP server, bounced email and unsubscribe processing, recurring mailing scheduling, fast email delivery, Unicode and international character support, and ease-of-use. Send out personalized messages and manage multiple email lists. from collecting your emails to verifying and saving your email lists. Qweas is providing links to e-Campaign 9.0.8 as a courtesy, and makes no representations regarding e-Campaign or any other applications or any information related thereto. Any questions, complaints or claims regarding this application e-Campaign 9.0.8 must be directed to the appropriate software vendor. You may click the publisher link of e-Campaign on the top of this page to get more details about the vendor.